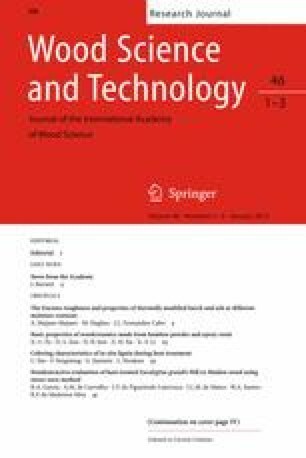 The fracture toughness of thermally modified beech (Fagus sylvatica L) and ash (Fraxinus excelsior L) wood under Mode I loading was quantified using Compact Tension (CT) specimens, loaded under steady-state crack propagation conditions. The influence of three heat-treatment levels and three moisture contents, as well as two crack propagation systems (RL and TL) was studied. Complete load–displacement records were analysed, and the initial slope, k init, critical stress intensity factor, K Ic, and specific fracture energy, G f, evaluated. In the case of both species, thermal modification was found to be significantly affect the material behaviour; the more severe the thermal treatment, the lower the values of K Ic and G f, with less difference being observed between the most severe treatments. Moisture content was also found to influence fracture toughness, but had a much less significant effect than the heat treatment. The results presented were developed within the IP-SME project HOLIWOOD (Holistic implementation of European thermally treated hard wood in the sector of construction industry and noise protection by sustainable, knowledge-based and value added products). This Project is carried out with the financial support from the European Community within the Sixth Framework Program (NMP2-CT-2005-IP 011799-2). This publication reflects the authors view. The European Community is not liable for any use that may be made of the information contained therein. We would like also thank the staff of the Laboratory of Forest Products Technology, TKK, particularly to Pekka Tukiainen, for his support. Also thanks are due to the staff at the Institute for Systems based on Optoelectronics and Microtechnology, UPM, and in particular to David López-Romero Moraleda.